Samba is the recommended method to upload and manage a large amount of files, including directories and sub-folders or very large files. 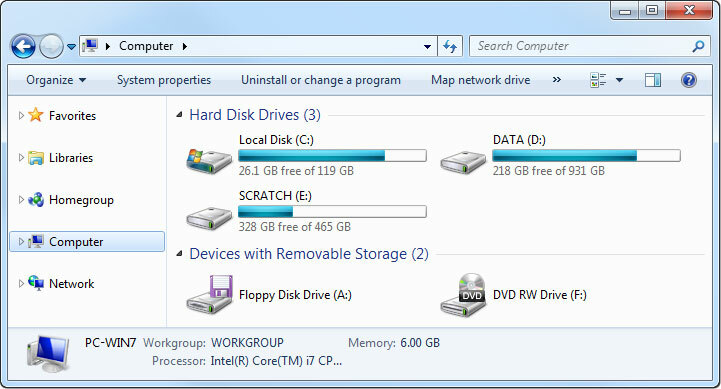 Once the network drive is mounted, you can manage the files just like you would do with any other drive on the computer. To change the host name of your network drive, go to Preferences > Network. You can only use Samba when both your network drive and the computer are connected to the same local network. If you are not at home and would like to access your files remotely, this method does not work. As an alternative, you could mount the drive using WebDAV, although the transfer rates will be slower and there are some other limitations as well. Instead, you might want to consider using FTP or if you don't have to upload a large amount of files, simply use the web interface. Go to Preferences > Samba. Make sure the Samba service is up and running. 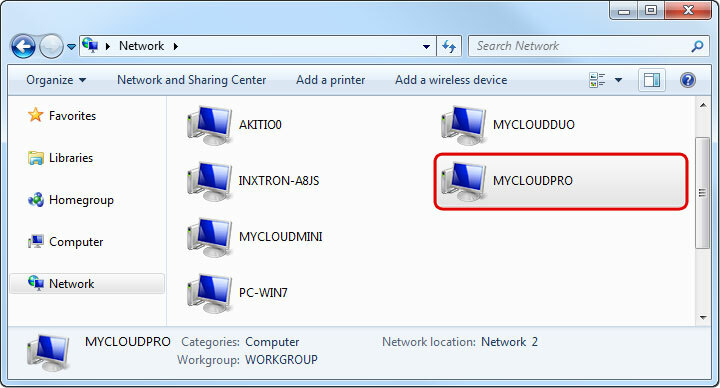 For the workgroup name, make sure the network drive belongs to the same workgroup as your computer. 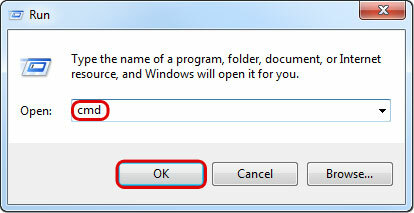 In most cases, you can set this to WORKGROUP. If your computer and the network drive both belong to the same workgroup, a shortcut to the network drive appears automatically. To access it, simply double-click on the shortcut. On your computer, open the file explorer and go to Network. 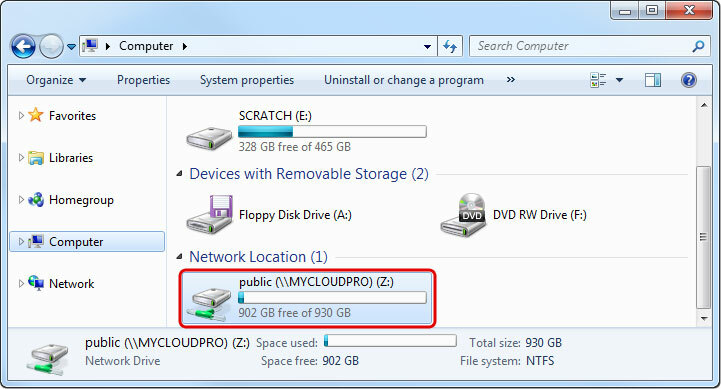 Select and double-click on the shortcut for your network drive. 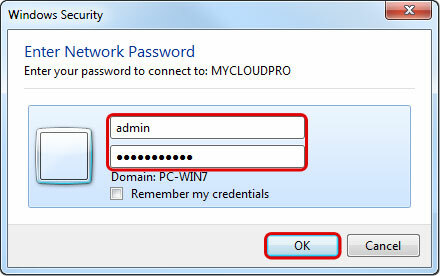 When prompted for the login credentials, enter the username and password of your user account on the network drive and click OK. As an example, the administrator would enter admin for both username and password. You can now access your files on the network drive. If you cannot find the network drive in your network neighborhood, you can access it by entering the path to the drive into the address field. Enter two backslashes followed by either the host name (e.g. 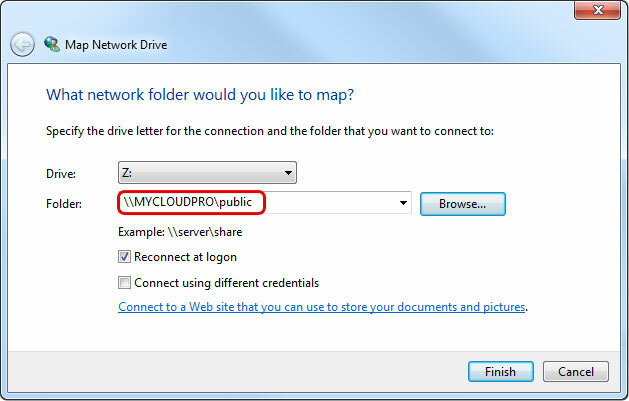 \\MYCLOUDPRO) or the IP address (e.g. \\192.168.1.30) of your network drive into the address field and then click Enter on your keyboard or click on the Go to arrow in the file explorer. To create a permanent link to your network drive that stays even after a system reboot, map the network drive to your system and enable the “reconnect at logon” option. If you create a permanent link using the IP address, it's best to change the network settings of your network drive from “Automatic” to “Manual”. This way, the IP address will always stay the same. For more details, see Preferences > Network. If you don't see the shortcut, go to Tools in the menu bar and there you can select Map network drive…. Enter two backslashes followed by either the host name (e.g. 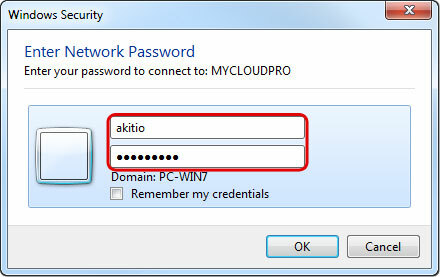 \\MYCLOUDPRO) or the IP address (e.g. \\192.168.1.30) plus a folder (e.g. 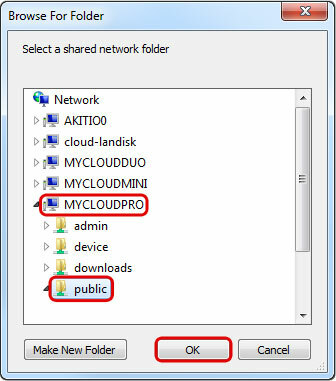 \\MYCLOUDPRO\public). 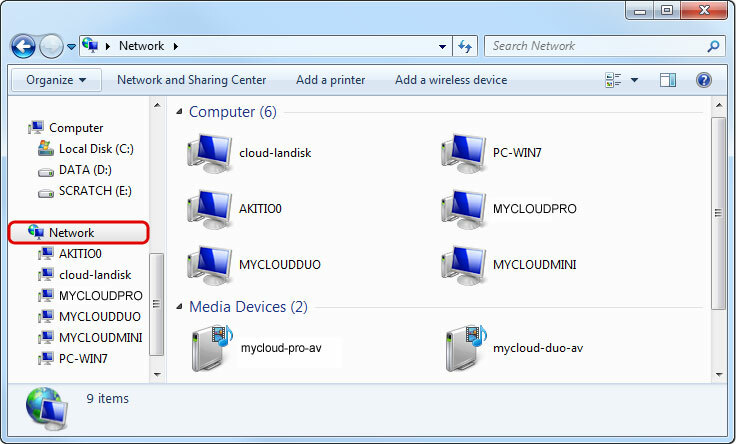 If you are not sure of the exact path, click Browse and select the network drive from the list of available devices. To create a permanent link that also stays after a system reboot, select Reconnect at logon and then click Finish to complete the setup wizard. You now have a permanent link on your computer and can access the files just like you would do with any other drive. When mapping a network drive on Windows, you cannot login with different accounts simultaneously, unless you use a different path (e.g. host name for one and IP address for the other). This behavior is by design as one server (uniquely identified by the given name) can only have one user authenticated to it at any given time. If you are already logged in as one user (e.g. 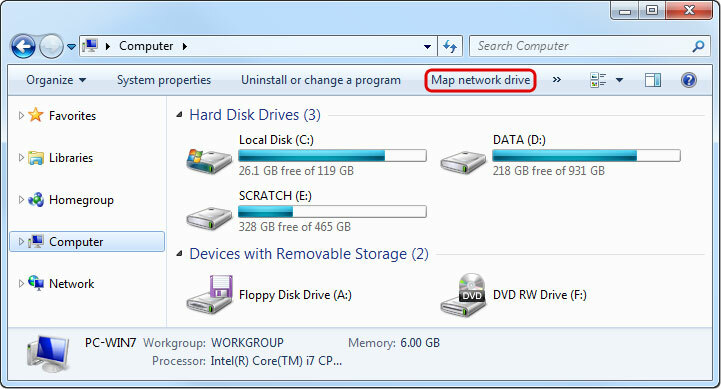 admin) and would like to map the network drive as a different user (e.g. a regular user account), please disconnect the network drive first, before you attempt to login as the new user. 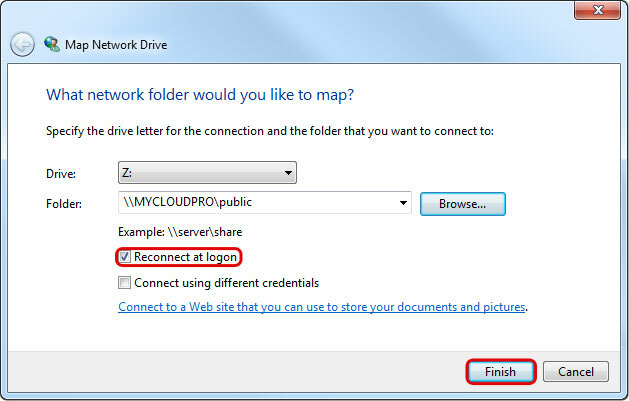 Unless you have mapped the network drive using the “reconnect at logon” option, you can either log off from Windows or restart Windows and it will automatically remove the mapped network drive. After login, you can then connect with your new user credentials. If you prefer not to log off or restart the system, please refer to the following instructions. Go to the menu bar and select Tools > Disconnect network drive…. Disconnect any of the currently connected folders on this network drive. Go to Start > Run… and type cmd to open the command prompt. Type net use to display the currently connected drives. If you find that your network drive still appears in that list, type net use /delete \\server\sharename to disconnect the drive. 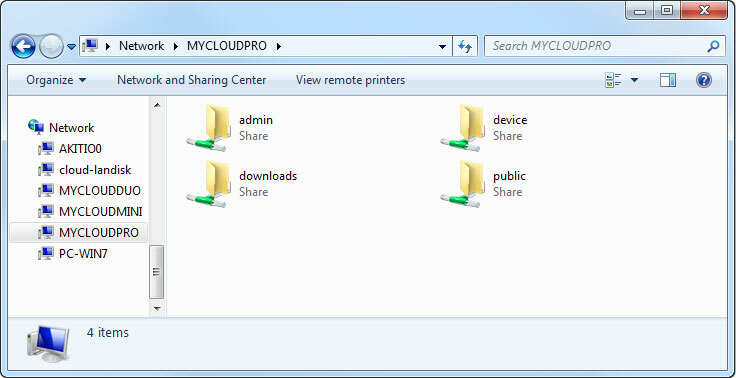 In this example the correct command is net use /delete \\MYCLOUDPRO\IPC$. Enter the new path to the folder that you would like to map and click Finish. When prompted for the login credentials, enter the username and password of your new user account and click OK.
Go to Start > Run and type cmd to open the command prompt. Check if your drive is on the list. Type net use /delete \\server\sharename to disconnect the drive. 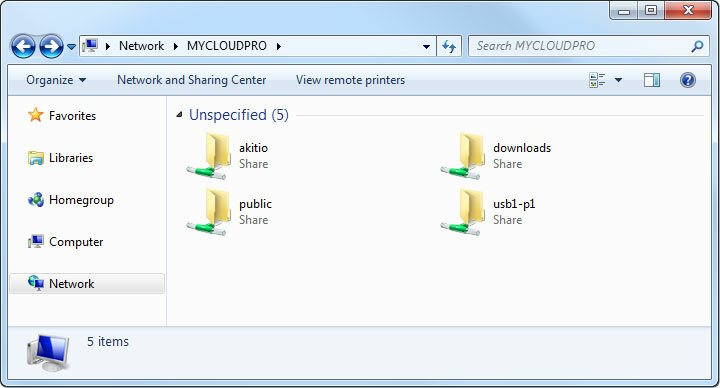 In this example the correct command is net use /delete \\MYCLOUDPRO\IPC$. You will get a message saying that the drive was deleted successfully. If you use net use again at this point, your drive should not be on the list anymore. You will get a message saying that the command completed successfully. 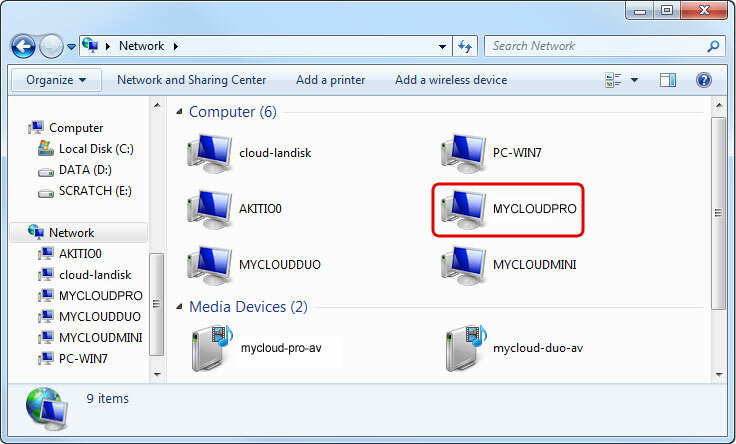 Open the file explorer and access the network drive in your network neighborhood. You can now access the drive as the new user, which you have defined in the previous step, without having to enter anymore login credentials. If you are unable to disconnect and login as a new user, please restart both your computer and the network drive before you try it again.